DON’T SAVE THESE JOBS FOR A RAINY DAY! 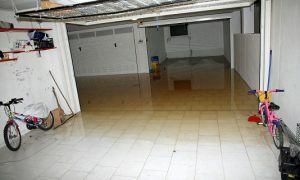 Water will flood or cause wet spots in the basement area when it rains. The water usually does not back up out of a plumbing pipe, but rather seems to mysteriously seep up out of the floor and through the joint where the basement floor and foundation wall meet. It’s no mystery. The majority of basement floods are caused by natural water found below your basement floor, called “ground water”. The level of ground water is called the “water table”. During heavy rainstorms, the ground will become saturated like a sponge and the water table will begin to rise. 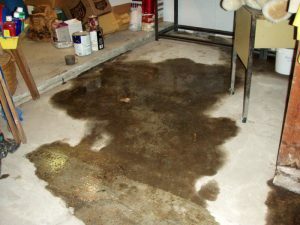 With enough water, it may actually seep through your basement floor (yes, even through concrete). After evaluating your specific water issue, we may recommend that a sump pump be installed within a specific location- usually in an existing sewer pit or it may be necessary to dig-out a new properly sized sump pit. We supply only good quality, heavy duty sump pumps constructed with cast iron housings. The pumps we provide are quiet, efficient and are backed by a 2 year manufacturer warranty. Call us anytime for a FREE, no hassle consultation! Have you ever lost power in your home? During a rainstorm, your regular sump pump may lose power and will not work to pump out the incoming rain water. A cost effective solution is to have a secondary sump pump system powered by battery. Working in conjunction with your primary pump, a battery pump will automatically start to work in cases of lost power or if the primary pump malfunctions. A built in alarm will alert you that the pump was activated. We provide and install battery back-up pumps with new systems or can even retro-fit your existing pump system. Space saving, low maintenance and ease of use are making these systems more popular in residential settings. Call our office and speak with our installer to discuss system specifics. A “French drain” is a positive way of controlling seeping ground water. This type of drain is basically an underground trench with drainage pipe and crushed stone. It can be installed in either a specific concentrated area or throughout your entire basement. The series of drainage pipes is then routed to a sump pump. As groundwater rises, water will enter the drain, be directed to the sump pump and then ultimately pumped out. Once properly installed, ground water level is controlled and will not rise above the level of your basement floor. Keep – It – Clean! We recognize that your home isn’t a construction site. Before starting a job that involves digging and the possible generation of dust, we spend the appropriate amount of time to setup our work neatly and professionally. Drop clothes, temporary plastic walls and surface protection all help to Keep – It – Clean!